Promoting someone's independence and assisting his or her participation in activities is often described as rehabilitation. If a support worker begins working with a client directly after their discharge from hospital, they will inevitably come into contact with the health professionals working with the same client. It is important for support workers and health professionals to work closely together, to help the client achieve their own independence goals. The graphic may take a few moments to load. Click on the Line to click through the screens. Think about things you have learnt over your lifetime and how they may fit into this cycle. Case Managers: They are frequently the primary contact person, with whom individuals can raise issues, express concerns and ask for extra information. The case manager will develop and oversee a person’s rehabilitation plan. They will often meet with support workers prior to an attendant care program being introduced. Occupational Therapists: Look at how people are functioning in their everyday life at home, work and/or in the community. Occupational therapists will look at how this may have changed for a person after a traumatic brain injury and then suggests new ways to do things or modified equipment to help a person be independent in that activity. Social Workers: Can assist people deal with the emotional and social results of a traumatic brain injury. This can include assisting clients and their families adjusting to changes in their lifestyle, relationships, work and leisure activities. This assistance can be in the form of counselling, support, and advice on other services and agencies. Physiotherapists: Help maximise physical functioning after a traumatic brain injury. They can assess and treat posture, movement, muscle strength, coordination and fitness. They also provide advice on splints and walking aids. Speech Pathologists: Assist people with communication problems. This includes assessment and treatment of how a person understands speech, expresses themselves, and their reading and writing skills. They can also look at improving the way a person communicates with others socially and advise on swallowing and hearing difficulties. Psychiatrist/ Psychologists: Treat psychological and emotional problems. They can assist a person come to terms with their injury or better manage their temper. They can also provide feedback to families and friends about managing a person’s behaviour. Neuropsychologists: Can assess the impact that a traumatic brain injury has had on a person’s cognitive process eg memory and thinking. They can explain what problems these changes in thinking may cause, and may offer ideas on how to manage these changes. Recreation Officers: Can assist you to identify potential leisure and recreation pursuits. They may also provide you and your family with details of appropriate community resources in relation to sport, leisure options, respite and community living. 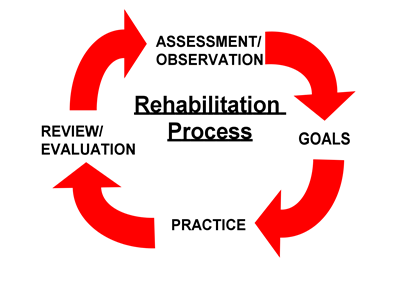 Rehabilitation specialists (Doctors): Monitor medical issues following a person’s injury. They usually work with an individual while they are in the hospital and then review them after discharge in outpatient clinics.